He was of Scottish, Irish decent and came from soldier stock, a great grandfather and two great uncles having served in the Revolutionary War. The father of General Carnahan, the Reverend James Aikman Carnahan was a native of Kentucky and graduated from The Auburn Theological Seminary, which was established by the Presbyterian Synod of Genesee in 1819, and who went as a missionary to Lafayette, Tippecanoe, Indiana in 1827 and was pastor of one Presbyterian church for some fifty years. His mother Martha A. (Dawson) Carnahan married the Reverend James Aikman Carnahan in Clinton County Indiana on 12 February 1839. When he was fifteen years old he began work as a bookkeeper and expected to begin his collegiate courses as soon as he could secure enough money. Then in 1857, came a financial crisis that swept the state, and carried away all his carefully deposited earnings. Notwithstanding this disaster he determined to have an education, young Carnahan entered Wabash Collage at Crawfordsville with $5.00 in his pocket. He sawed wood, swept the halls, worked in the garden and kept a set of books for a business house and thus worked his way until the breaking out of the Civil War in 1861. For two years prior to the war he had been a member of a military company, thought to be the “Montgomery Guards”, under the command of Captain and later Major-General Lew Wallace, and had profited by the thorough drill and discipline then obtained. . In April 1861 at the first call for troops he enlisted as a private in Lew Wallace’s Zouaves, the Eleventh Indiana Volunteer Zouave Regiment along with thirty other Wabash students in Company I of that regiment. Muster In 22 April 1861, from Montgomery County, in Company I of the Eleventh Indiana Zouave Regiment and Muster out 04 August 1861 upon the expiration of term. 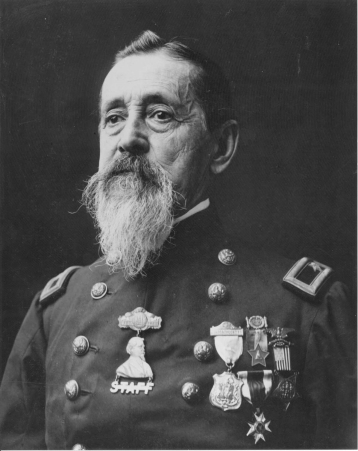 Also in the 11th was the future first Department Commander of the Grand Army of the Republic, Captain Robert S. Foster of Company A, later to be Major General. He then muster in 22 December 1862 as Second Lieutenant, Commission dated 30 November 1861 in Company L, 86th Indiana Volunteer Infantry, Home City Dayton, Tippecanoe, Indiana. Mustered in 04 September 1863 as Captain, Commission dated 01 August 1863 Company K in the 86th Indiana Volunteer Infantry, Mustered Out 06 June 1865 at Nashville, Davidson, Tennessee. He filled various official positions in his company and regiment and in the last year of the war was a staff officer. At the close of the war he was offered a commission in the Regular Army, but owing to opposition of family and friends he did not accept. His most important service during the campaign prior to and including the battle of Nashville Tennessee. He was aide-de-camp on the staff of General T.J. Wood, commanding the Fourth Army Corps, and received high compliments from his commanding general and Major-General George H. Thomas, commanding the Army of the Cumberland, for faithful and efficient service. Following the battle of Nashville he participated in a campaign in East Tennessee and on the termination of hostilities returned to Nashville and took part in the finial grand review of the troops of the Army of the Cumberland. During his army service he participated in thirty-three general engagements. In the autumn of 1865 he re-entered Wabash Collage at which he graduated in June 1866. He entered the law office of Ray, Gordon and Company at Indianapolis, in the autumn of 1866 and was graduated by the Indianapolis Law School. He was admitted to practice in the Superior Court of the State in 1867. He then established himself at Lafayette in October 1867, was elected county prosecutor of Tippecanoe County Indiana, a position he filled until 1873. He married Susan Elizabeth Patterson on 07 November 1867. In October 1874, he was elected judge of Tippecanoe Criminal Court. Commissioned Judge of the Tippecanoe County Criminal Court on 22 October 1874 with a term to begin on 27 October 1875 for four year but the position was abolished by the Indiana State Legislature before he could take the bench. 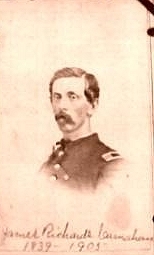 Captain Carnahan, who had from the beginning in 1866, been active as aide-de-camp in organizing the G.AR. in Tippecanoe County, and elsewhere. Under the Department Order of November 1 1866, he was substituted for Captain Stein, who was prevented from serving as District Commander. As commander he became the mascot of the soldier. He quickened the energies of the "boys" and roused in them the enthusiasm for the organization. Eight strong posts were established in Tippecanoe County, chiefly the result of his work. He was sent as a delegate to the first National Encampment, 1866 and there his methods and practical knowledge found ready support in the work of the encampment. His career in the Grand Army in those days was the primer work for his later life. His genius and magnetic touch with the "boys" carried him beyond the limits of Indiana, from a department aide to that in later years Inspector General, and the two terms as Judge Advocate-General on the National Staff under the first reorganization. He later held the position of Department Commander, to which position he was elected two times, 1882 - 1883, by unanimous vote of the Encampment. In his first year as Department Commander, he increased membership from 2,050 to over 8,000, and at the close of his second term membership had increased to over 16,000. He was also made the Provisional Department Commander of Tennessee and Kentucky upon the reorganization of the order. He has also honored himself, as well as the Order, as the author of a National Digest of the opinions and rulings of the Judge Advocate-General of the G.A.R. This digest was not only approved and adopted by the National Encampment, but it became the foundation stone upon, which Past Commander-in-Chief Beath built his "Blue Book" or what is or was called the "History of the Grand Army of the Republic." In his closing speech to the 1883 Department Encampment he proposed building a war memorial in Governors Circle in Indianapolis, this being the first mention of that memorial. He was appointed, in 1895, to be president of the board of trustees which oversaw the construction of the Soldiers and Sailors Memorial built in Indianapolis. In this capacity he was largely instrumental in securing the appropriation of $200,000 to build the Indiana Soldiers and Sailors Monument. He was, after moving to Indianapolis, a member of Robert Anderson Post No. 369, Grand Army of the Republic. He was also a member of the Association of the Survivors of the Battle of Stone River and the Military Order of the Loyal Legion of the United States with Badge No. 3004, Indiana Comandery. He was nominated to be Commander-in-Chief of the Grand Army of the Republic in 1905, but his name was withdrawn when he became ill.
His history in the Knights of Pythias began on October 15 1874, at which time he became a member of Lafayette Lodge No. 51, in which he retained membership until his death. He entered the grand lodge of Indiana after passing through the chairs of Lafayette Lodge and was elected grand chancellor of Indiana in January 1880. In the order he was looked upon as the founder of the Uniform Rank, the distinctive military rank of the order. In the winter of 1876-1877 he organized what was then known as the Lafayette K. of P. drill corps which later was to be called Lafayette Company No. 1 Uniform Rank. He would be its first Captain. In January of 1881, Governor Porter appointed him Adjutant General of Indiana, and until January 22 1885 he devoted his entire time and energies to the betterment of the States Military recourses. When he assumed charge the affairs of the Adjutant Generals office were in a bad order and the military spirit if the State at a low ebb. Out of the confusion and an overwhelming lack of interest he constructed enthusiasm and order. In 1884, under his direction, separate regimental encampments of the Indiana militia were held at Richmond and Peru. Without any aid from the State by way of appropriations, he obtained for Indiana a thorough and available body of organized militia, put the troops into camp three years in succession for a week at a time, and sustained them by private contributions induced by the military spirit he had aroused in the people of the State. After he retired from the Adjutant Generals Office, due the changing political climate, he was commissioned Brigadier General of the then Indiana Militia, which later became the Indiana National Guard. At the session of the Supreme Lodge K .of P., of 1882 he was placed on the committee on Uniform Rank and drafted the additions to the general by-laws where the regimental organizations of the order were made in grand jurisdictions having a certain number of subordinate divisions. This committee was made a standing committee and this labor resulted in completely reorganizing the Uniform Rank as it then existed. A book of tactics was prepared by him and Lieutenant W.R. Hamilton, of the United State Army, General Carnahan writing most of the tacticts and superintending the publication of the book. This work was given to the Supreme Lodge. The first edition of “Tactics and Manual for Uniform Rank Knights of Pythias”, was published in Cincinnati, Ohio in July 1883. He also authored the “Pythias Knighthood: Its History and Literature”, published at Cincinnati, OH 1888; Camp Morton: A Reply to Dr. John A. Wyeth, published Indianapolis, Indiana 1892; “The Eighty-Sixth Indiana Volunteer Infantry, A narrative of its services in the Civil War 1861 – 1865,” Authored With James Barnes and T.H.B. McCain, Crawfordsville, Indiana 1895. At the session of the Supreme Lodge of May 01,1884 he was elected and commissioned as the first Major General and placed in command of the Uniform Rank, Knights of Pythias of the world, a position he held continuously until his death. In 1904 he was appointed by President “Teddy” Roosevelt to be on the visiting committee to West Point Military Academy, and delivered an address before the graduates of that school of the class of 1904. General Carnahan was member of Second Presbyterian Church, a member of Mystic Tie Lodge F. & A.M. and a 32nd Degree member of the Ancient and Accepted Scottish Rite. He was recognized as a most zealous, faithful and efficient in everything he undertook, being master of detail, with a clear head and always working with a definite purpose in view. He was esteemed in every relation in life, and in the Pythian brotherhood was doubtless its best known and most influential member. General Carnahan died at Indianapolis, Indiana 03 August 1905 at 6:35 AM at his home at No. 8 West Drive, Woodruff Place. His health began to fail about the middle of January 1905 and he was not able to conduct business after May 26 1905. For four weeks prior to his death he was confined to his room. The members of the family who were at the general’s bedside and who showed every attention were his daughters, his brother Doctor Joseph L Carnahan of Kansas City, Kansas, Mrs. Ralph H. Hess of Fort Collins, Colorado, Mrs. Michael Steele Bright of Superior Wisconsin and Mrs. Herbert Ashbrook of Cleveland Ohio and his sitter, Mrs. J. C. Tebbets of Chicago, Illinois. His son-in-law Herbert Ashbrook and Michael Steele Bright are also with him and Mrs. Carnahan who was constantly at her husband’s side. The funeral was held from the family home, 8 West Drive, Woodruff place at 2pm Saturday. The funeral was conducted by the Uniform Rank of the Knights of Pythias, this would have included Colonel Shellhouse, SUVCW who later would become C-in-C. Many members of the K. of P. from the state and beyond were in attendance. Reverend O. D. Odell of the Second Presbyterian Church of Indianapolis conducted the burial on 05 August 1905, Crown Hill Cemetery, Indianapolis, Marion, IN, Section 36, Lot 243. Susan Elizabeth (Patterson) Carnahan was buried next to her husband on 20 May 1914. Submitted by Stephen Bruce Bauer with assistance from Tim Beckman.